Are you concerned about a carpenter ant infestation? If you have discovered carpenter ants in or around your home, business or property, we have a solution. Sure Thing Pest Control has been eliminating carpenter ant infestations and problems since 1998. Our team of professionals is highly skilled and trained at discovering the source of the carpenter ants and eliminating them there. Ants invade when they are looking for food and shelter, but you rarely see the source of where they are coming from. When you get them at their source, you eliminate them for good. 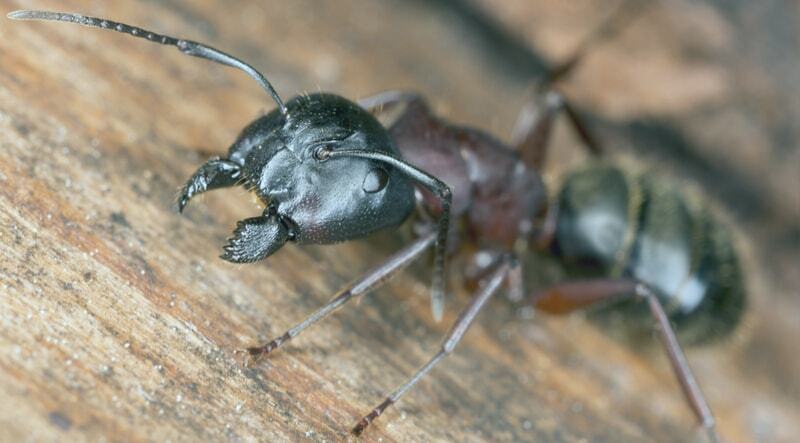 Carpenter ants are often mistaken for termite swarms or colonies. Carpenter ants are not as damage prone as termites unless they get into your home, business or property. To eliminate carpenter ants it is important to understand and locate their satellite nests as well as the parent nest that houses the queen. At Sure Thing Pest Control we have the team and experience to destroy the carpenter ant nests. If you locate or think you know where the nests are, it is highly advisable that you don't try to destroy them yourself. Contact a Pest Professional since killing carpenter ants is not easy and may take several treatments. Sure Thing Pest Control has been serving Greater Cincinnati and Northern Kentucky since 1998. We are a local family owned business and have the same concerns you have over maintaining a pest free environment. When you make Sure Thing your exterminator choice you are receiving an industry leading company with top rated technicians and superior customer service. Contact us today for a FREE estimate on your best and most affordable pest control program. Inspection, provided me with information about the problem, answered ALL of my questions and told me about the background the company, smoked the flies out with “bombs” or sprays. Love this company! Cincinnati is your best choice. Sure Thing Pest Control has protected countless Greater Cincinnati & Northern Kentucky homes & businesses from infestations and pest problems. Locally owned by Glenn Scherzinger and Jerry Zapf, they bring over 55 years of combined experience to Sure Thing Pest Control, as well as, a quality reputation. Unlike many pest control providers, we steer clear of “one-size-fits-all” programs. We evaluate your insect problem, provide a thorough inspection, and implement a program suited to your individual needs. We always provide services that render the absolute best results and incorporate Integrated Pest Management into each of our programs. Integrated Pest Management is the combining of appropriate pest control tactics into a single plan to reduce pest and their damage using economical means with the least possible hazard to people, property, and environment. A service driven company with a full team of experts both in the field and office. A team with over 200 years of combined experience using the best scientific practices. Detailed solutions using only quality products and delivering precise results. Results in harmony with your needs, requests, & expectations. A committed company to quality service with guaranteed results.